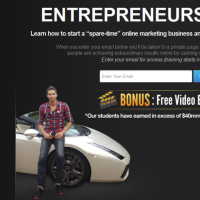 This Lead Capture Page is very similar to the previous one “Entrepreneurs Unleashed” and again appeals to people who want to start a business online in their spare time and that aspire to becoming successful at it on their own terms. The big difference is the image of Stuart Ross and Jay Kubassek with their cars of choice. This has more of an “I would like that too and could achieve it” appeal.